NFI technologies provide capabilities to streamline global supply chains. Cargo Services Far East is one of the largest independent supply chain companies in Asia. Global Distribution Centers will allow customers to efficiently manage their North American operations. Supply chain solutions provider NFI has launched its new global integrated technology suite. The new technology provides customers the tools needed to improve performance, visibility, and bottom line results. Solutions available within the technology suite include Smart Portal, Global Veritas, and Business Intelligence. Each technology provides capabilities streamlining the global supply chain. NFI also recently announced a new Asian joint venture, NFI Global Cargo Services. This venture combines the strengths of two seasoned supply chain companies, Cargo Services Far East and NFI. Cargo Services Far East is one of the largest independent global supply chain companies in Asia. NFI will leverage its expertise in distribution to help customers expand their global reach. Cargo Services Far East provides extensive infrastructure, servicing the most sophisticated supply chain needs of major clients around the world. The new Global Distribution Centers will allow customers to more efficiently manage their North American operations as well as reach consumers around the world, particularly in the fast-growing markets of Asia. NFI provides services in dedicated transportation, distribution, commercial real estate, intermodal, and brokerage across North America. Headquartered in Cherry Hill, New Jersey, the family-owned business was founded in 1932, generates more than $1.3 billion in annual revenue, and employs more than 8,300 associates. NFI owns facilities globally and operates more than 31 million square feet of warehouse and distribution space. 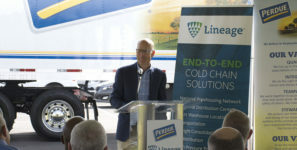 Its company-owned fleet consists of over 2,200 tractors and 8,200 trailers, operated by more than 2,600 company drivers and 325 owner operators.